I’m back! And boy was Crete glorious! I have to admit, I am missing the sun already. I need to go out in this wretched weather but all I want to do is wrap myself up in a duvet and re-live last week, cocktail in hand. Oh well. Life in London must go on. I missed my sewing machine and cannot wait to get started on making tops and dresses. I wasn’t able to sew everything that was on my island-spired sewing list but I do still plan to make them soon. Day 1 of MMM’12 is brought to you by the a Colette Sorbetto I never blogged about. 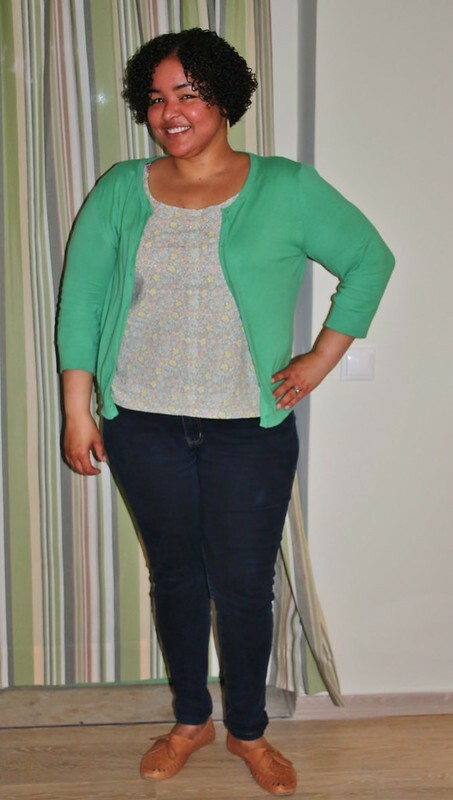 It’s a buttery floral top that I love wearing with my mint green cardi. It was the perfect travel outfit; nice and comfy. Warning: I apologize if my eyes look shifty or cartoonish. They like to disappear as soon as the sun comes out. And that sun was BLAZING in Crete. It was wonderful. 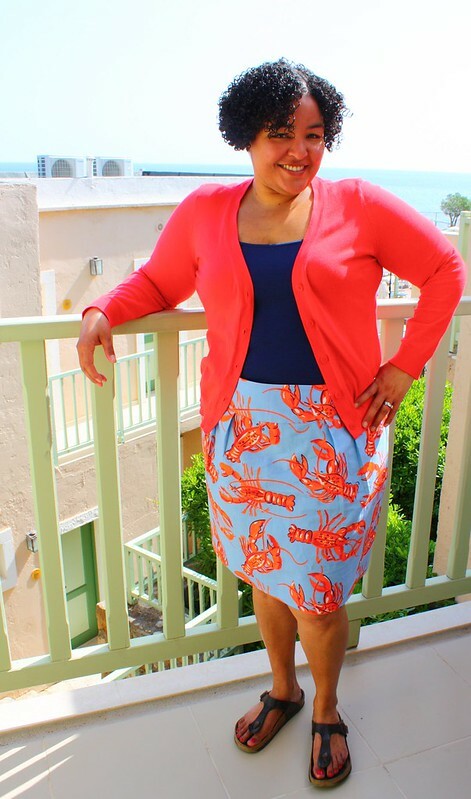 On Day 2 I wore my Simplicity 2451 Lobster Skirt. That cardi didn’t last long. It was super warm by the time 10AM rolled around. 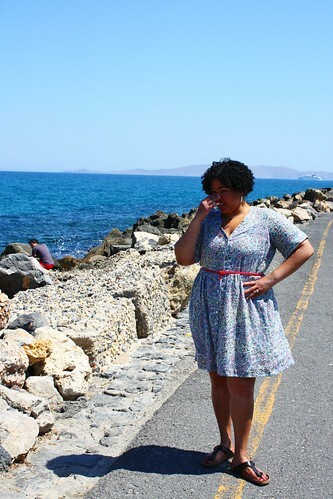 I wore my new linen paisley Darling Ranges Dress on Day 3. It was very see-through so I had to wear it with a light slip. It was so light and airy, like wearing my own personal air conditioner. I’m having a love affair with linen and linen/cotton at the moment. I wore it quite a bit on this trip. The sun was killing my eyes. So not used to it anymore. Another Darling Ranges Dress. Not a perfect make but I’ll take it. I griped about the darts on this garment but I still wear it ALL.THE.TIME. I love the blue color with the contrasting buttons. It’s uber comfy and makes me feel like skipping. 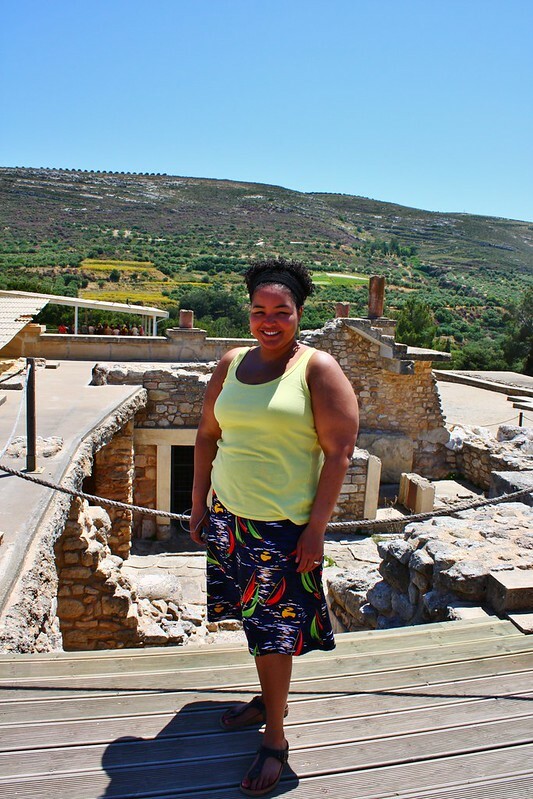 On Day 5 We headed to Knossos Palace, where the land the palace is built on was first settled in 8000 B.C. WHOAH. Day 6 I wore a linen/cotton mix maxi dress (New Look 6230). 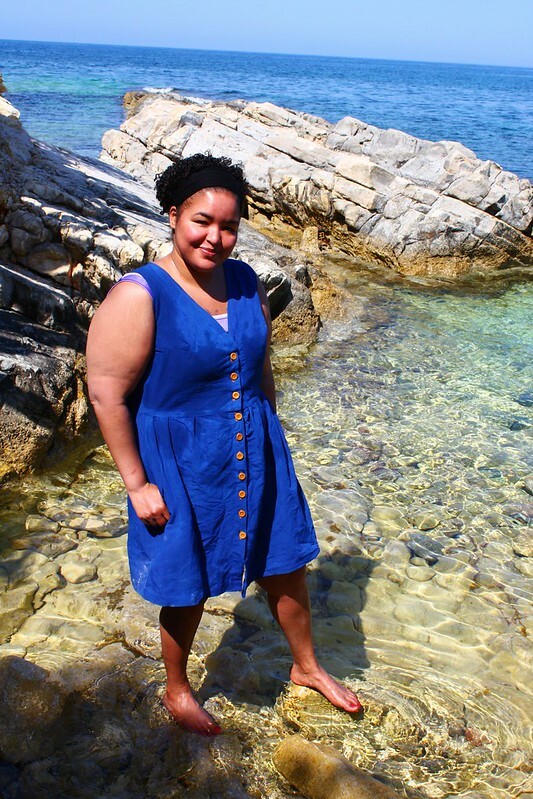 Day 7 was spent pool-side so I wore my linen Darling dress as a bathing suit cover-up. Day 8 was our last day in the sun. Boo. 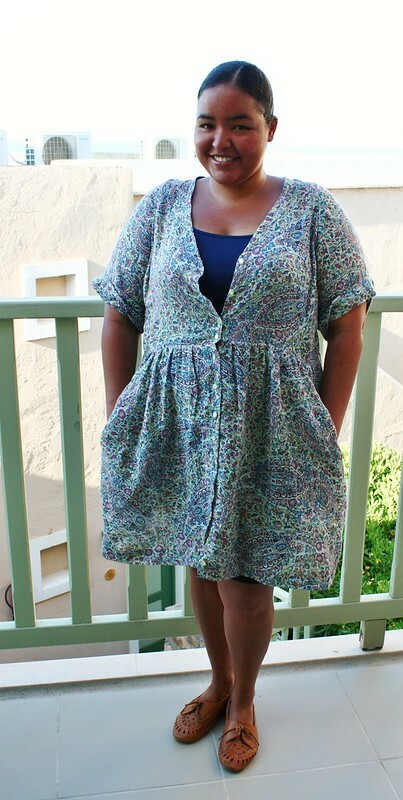 I wore another not-blogged Colette Sorbetto, made with a linen/cotton paisley fabric. So my first MMM’12 week went great! I definitely did more than the 3 days a week that I set out to do but that was my plan. I know it’ll get more complicated as the days go by so I might fall back to 3 days at some point. Although, I am hoping not to. Can someone please work on getting the sun to visit England? This weather is bleak! *UPDATE: I thought I wore my maxi dress and my linen Darling dress on the same day (Day 6) but realized it was in fact two separate days. Helps that my hair was styled differently in both photos. Ha! 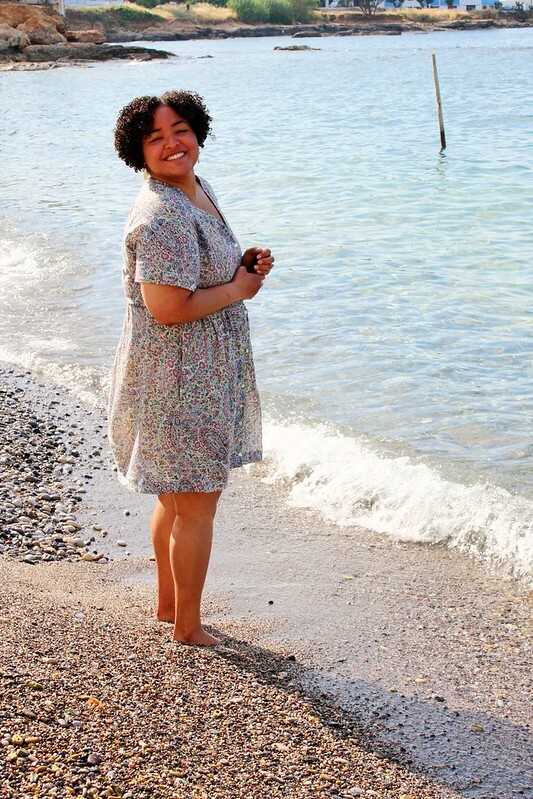 This entry was posted in Me-Made-May and tagged Colette, Darling Ranges Dress, Me-Made-May'12, vacation. Bookmark the permalink. 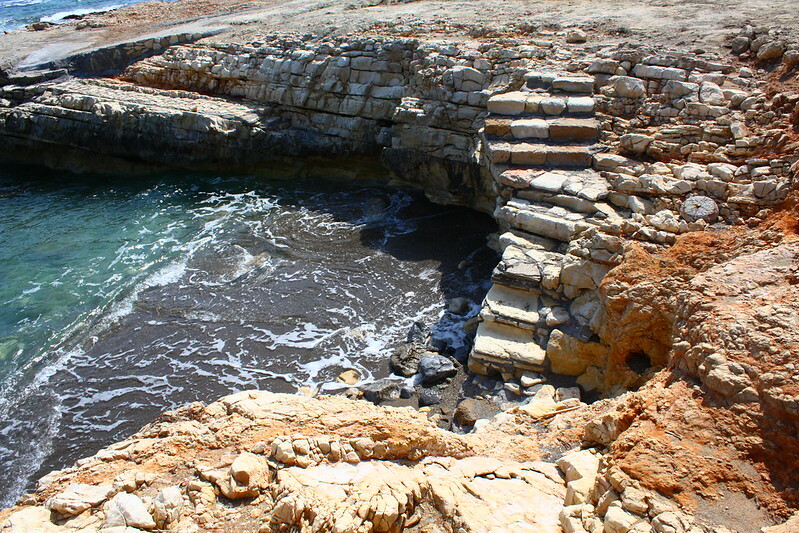 Crete looks amazing. You look adorable. Not remotely squinty. And your outfits are fabulous. A great week all round, I think. Gorgeous photos! You look fantastic in all of them! I love all your outfits, but especially the sailboat and lobster skirts. What a wonderful selection of pretty and wearable outfits. You’ve got practical sewing down pat. Crete looks wonderful! Gorgeous outfits! I especially love the lobster skirt and maxi dress. Great photos, as always. The only thing that consoles me after a vacation is planning the next one! Yes! So true. I am trying to convince the husband that Istanbul needs to be our next trip. For some odd reason he’s not convinced. Must convince harder. Do not miss a chance to go to Turkey!! The people are so hospitable, the food is amazing, and there’s so much history there, not to mention amazing beaches. I agree with Gail, I think the sail boat skirt and the lobster skirt are some of my favorites that you have made. Crete looks gorgeous! Thanks! I’m sure you’ll make some lovely stuff. SO jealous! I went to Corfu in 2002, and have been dreaming of Greece ever since. It may be the perfect place. Also, that New Look dress?! Amazing! Where did you get the fabric? Gorgeous!!! Thank you. I bought the fabric at a nearby fabric shop, Rolls and Rems. They have the best remnant bin. I almost used this fabric for a table cloth. Glad I didn’t. Now Buttercup, when you get bored with any of these outfits- you just mail them on to little me- I love them all!!! I’d also like to start a sentence with ‘Crete was glorious’ at some point in my life! Lucky! Wow, stunning scenery to match your lovely makes! It’s so nice to know that at least you got some sunshine…it’s so horrible here, makes me want to cry! 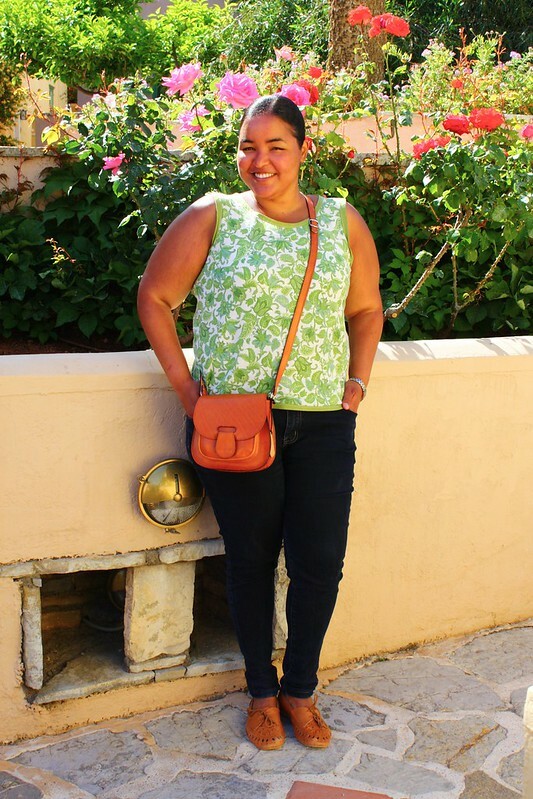 Can I also just say how great you are looking in your jeans and Sorbettos? Fantastic stuff!!! Thank you! I was hoping to bring back the sun with me but no luck. I love these photos and outfits. You make MMM look so easy! Having to plan the outfits out so I can fit them into a small carry-on bag helped, thankfully. Crete looks gorgeous! Outfit 6 the maxi dress is my favourite with lobster skirt being a close runner up. Thank you! That maxi was a last minute add. Glad I went for it. Oh my gosh, I’m so envious that you got to wear summer me-mades! I’ve been grumpy about it being stuck in between seasons here. I love your linen dress in particular, it’s fabulous. I am really glad I got to wear some nice light clothes this month. Now I find myself dressed in layers. Boo. Love the lobster skirt and the African inspired maxi. Tres fabulosity . . .
wow – great me made wardrobe! 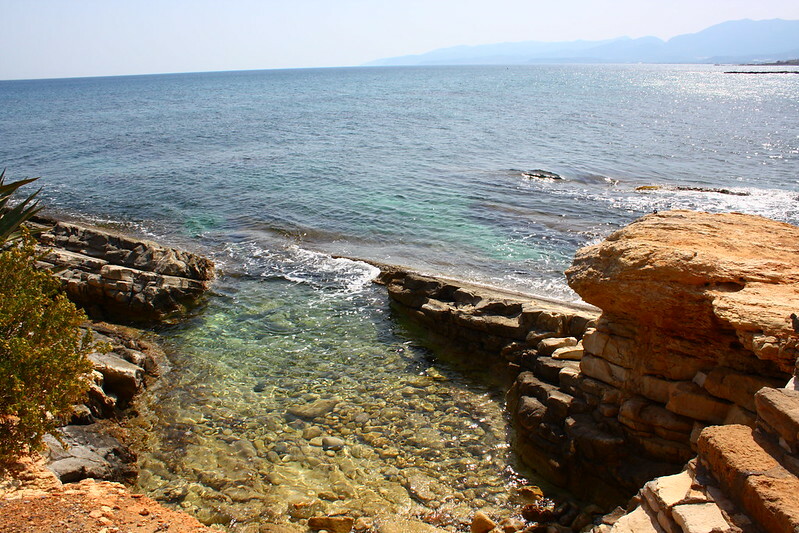 Crete looks amazing – I’m too too envious! hope the sunshine follows you back to the UK! Take me with you!!!! How gorgeous! And I love all of your outfits!! I am so happy that we are friends on Instagram! I have enjoyed looking at your beautiful photos. 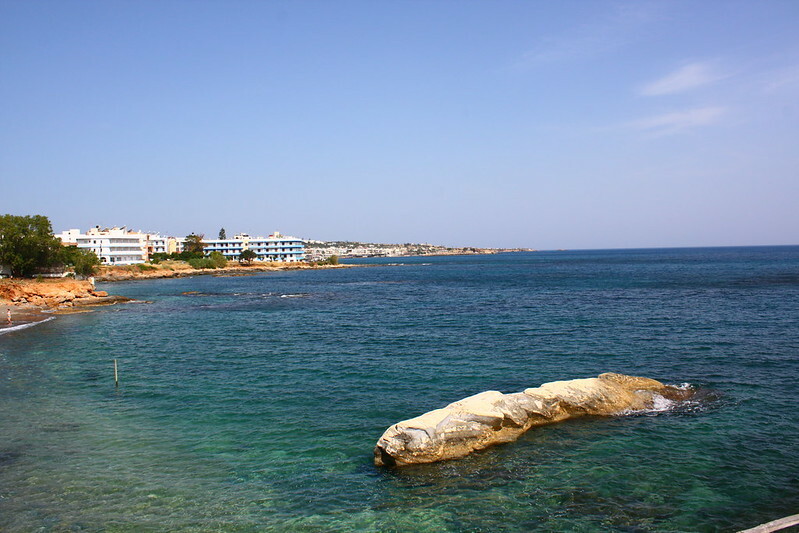 Crete looks gorgeous! And your Me-Made outfits are spectacular. Way to go! What fabulous backgrounds for your pictures! I adore your lobster skirt with a fiery passion, and your Sorbettos are so lovely! You and your clothes look great. I have to admit I am super covetous of that linen paisley Darling Ranges Dress! It is too cute! Thank you. It’s going to me my travel dress for sure. It doesn’t wrinkle! Huzzah! Wonderful me made holiday wardrobe! So bright and……summery. 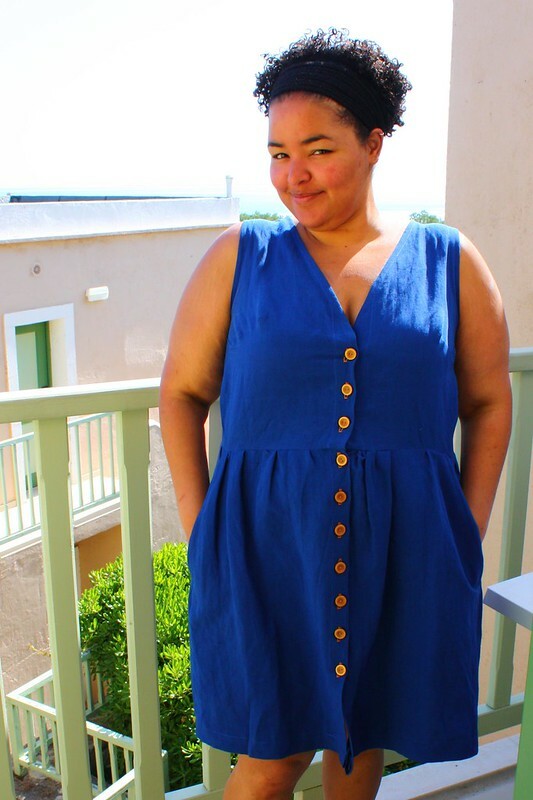 I feel my resistance to the darling ranges dress ( linen floral) is severely weakened afterv this post…..
Ooooh you lucky lucky thing you – am so jealous! We’ve been wasting away here in the gray drizzle! I love your maxi dress and your darling ranges dresses – superb! I never thought of making a maxi dress for summer but I think you’ve just inspired me! Do it! 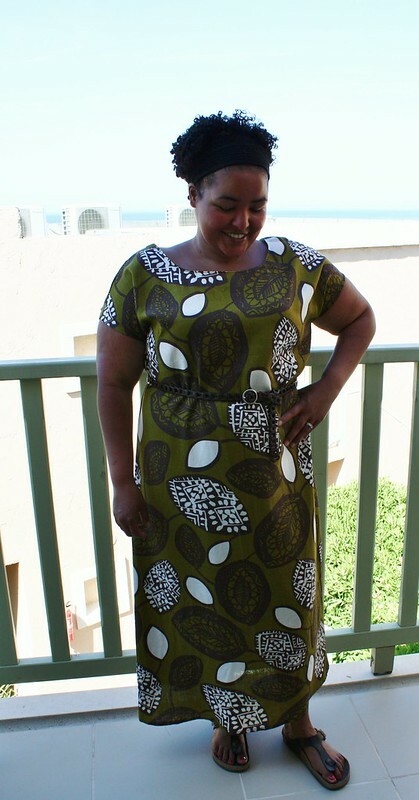 I have been tempted to make another maxi dress using the Refrew pattern as my base. These are all lovely! And so practical, well done on your first week of MMM12. Of course it helps being in the sun! Wow! Crete is gorgeous!!! I have to get there soon. And look at that beautiful sun after all of this icky English rain we’ve been having. I also love the wardrobe! Too damn cute!! I love the lobster skirt. Glad you had a wonderful week!!! Oooh, Crete! I went there once, years and years ago. Isn’t it beautiful? Your wardrobe is too! I love the maxi dress especially. It’s breath-taking! I wish we had more time to see the island. Crete looks amazing!! And your outfits are fantastic. I wish you sun and light and warmth this weekend! Thank you! I very much enjoyed some time in the sun today. Even managed to finish a maxi dress. Hurrah! It’s such a nice pattern. I definitely find the dresses super comfortable and would recommend it. The day 6 maxi dress turned out gorgeous after your sneak peek the other day! And those darling ranges dresses look perfect, casual but pretty. How come I managed to miss this post of yours, I don’t know, but I love everyone single one of these outfits. My personal favourite is the green maxi dress. I’m eagerly awaiting for MMM 2013. Are you going to follow the same concept? I might! I know it’s a bit late but I saw your skirt in a google image search and I couldn’t help but post here and tell you I loooove your lobster skirt! So cute!